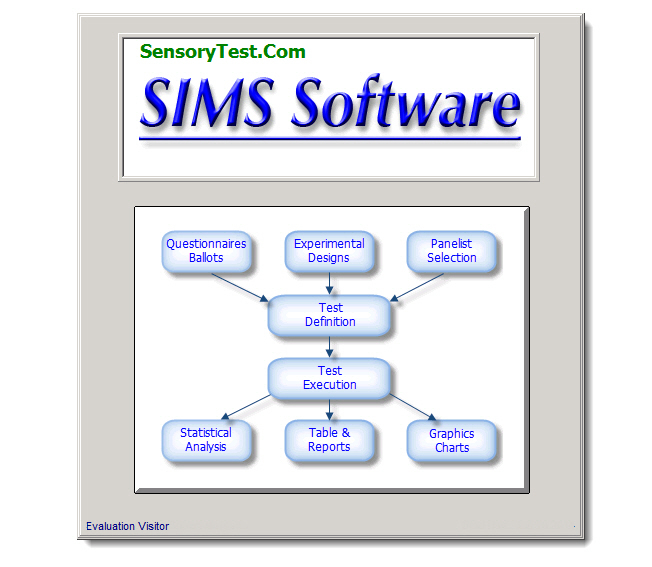 Welcome to your SIMS Sensory Quality Panel Software Systems Internet Testing! Your Sensory Technicians utilize our Cloud Server based SIMS Software Systems application, the same SIMS software application all of our clients already know well with a minimal learning curve. Your Panelists use any browser such as Internet Explorer to access www.SensoryTest.com. SIMS software generates Links which can be emailed by our Cloud Servers directly to your Panelists, HUTs, CLTs, or you may distribute the links independently. The Links are secure and specific to individual Tests. In many cases the Link may be the same for all Panelists in a given test, such as with Anonymous Panelists Tests. Example. 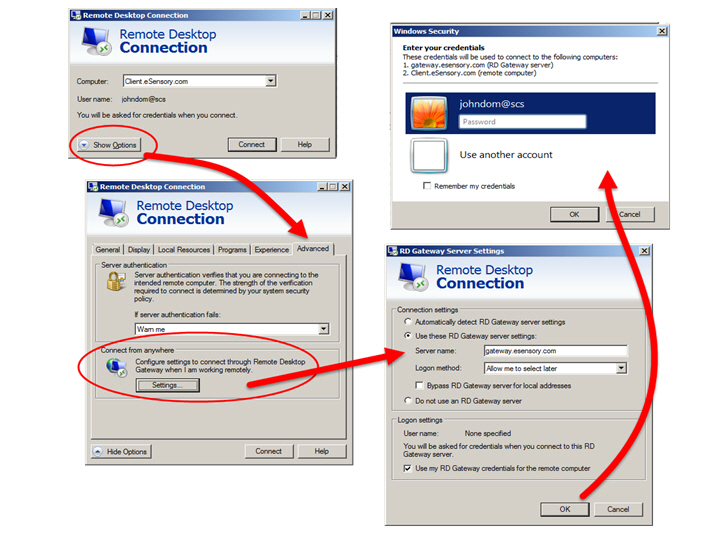 Your Sensory Technicians use the popular Microsoft Remote Desktop Connection already installed on most Windows PCs to access our Cloud Server based SIMS software application. Technicians do *not* need to use Internet Explorer to connect. There is no connection between your local in-house SIMS servers/database and our Cloud Server based SIMS software application. On your on your Windows PC, Click Start | Programs | Accessories | Communications | Remote Desktop Connection. Example screen shown below. Technicians connecting to our Internet servers. 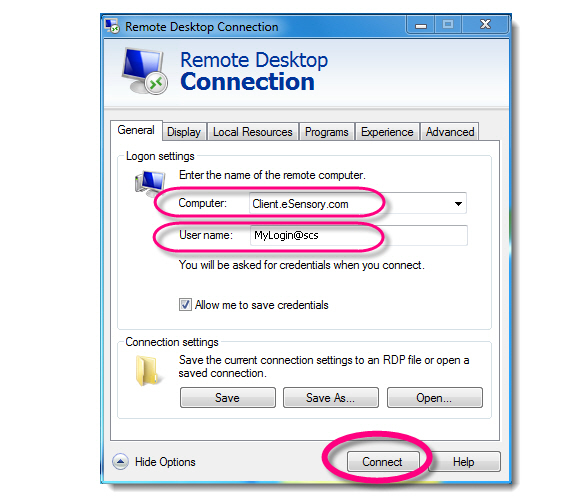 Use your Windows PC Microsoft Remote Desktop Connection shortcut. Type in our Internet Cloud Computer name: Client.eSensory.com or maybe Client.eSensory.com:443 if 1st choice didn’t get past your firewall. Bonus Hint: To allow for easy file transfers of reports, images, SIMS express files, etc., click on [Local Resources] Tab | Local Resources | Local Devices | [More] button, check the box [X] Drives. Step 2: If you get to here: SUCCESS! You're talking to www.SensoryTest.com ! Troubleshooting tip #1: RD Gateway connection settings. If the above attempts fail. Troubleshooting tip #1.